You don’t add 2 million people without scaling up. 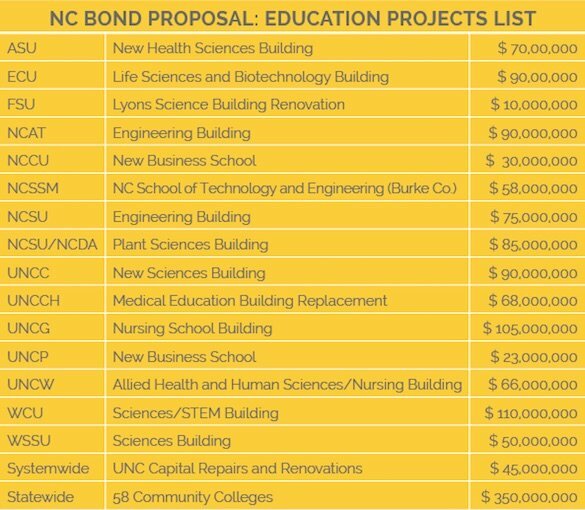 Two million people have moved here since the last state bond referendum in 2000.1 The Connect NC bonds on the ballot Tuesday are a modest effort to build educational capacity for a state of 10 million people that’s now the 9th-largest. The expansion is needed both because we have more people in North Carolina and because more of us demand an education. Health/Medicine/Nursing at UNC-CH, UNCG, ASU and UNCW. Engineering at NCSU, NCA&T and UNCA. Sciences at UNCC, NCSU, ECU, WCU, WSSU, FSU and NCSSM. It’s about making room for students – our children and grandchildren – in those fields. Similarly, community colleges would receive $350 million for needed repairs and expansions to help more students succeed, whether by mastering a new skill or transferring to a four-year school. It’s about Connecting North Carolina with the future. State officials are adamant that no tax increase is required to pay off the bonds. The amount is indeed modest. The bond proposal appears at the bottom of many primary ballots – or on the back, depending on the number of local races. So don’t miss it. Don’t make excuses. Don’t sit out an important decision about our future. 10 Duke University, Vice President for Public Affairs and Government Relations, February 19, 2016.